This page will introduce professional partition software, with which users can extend C drive or other partitions on Dell Server without data loss. Download IM-Magic Partition Resizer Server to extend C drive when it is running on low disk space on Dell Server. When you frequently receive alert message that C drive is running on low disk space on Dell Server, the safe way to resolve the problem is to extend C drive with help of third-party partition software. IM-Magic Partition Resizer Server allows you to extend Dell Server C drive without losing any data. If C drive is also system partition, IM-Magic Partition Resizer Server enables you to extend C drive system partition without touching the operating system. 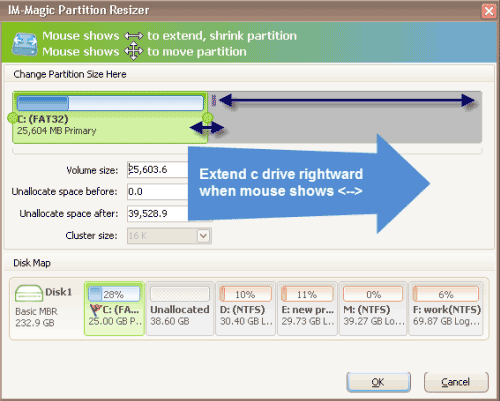 Download, install and run IM-Magic Partition Resizer Server. Right click a partition that has enough free space and go to "Resize/Move" option. Move the arrows to extend C drive and then click "Apply" button. IM-Magic Partition Resizer Server provides advanced functions to let you extend Dell Server C drive on all Windows Servers such as Windows 2003, 2008, 2012, SBS 2003, 2008, Windows Server 2003 R2, Windows Server 2008 R2, and Windows Server 2012 R2, etc. This partition software can help extend C drive on Dell Server with operating system untouched, so you don't need to reinstall system or worry about system crash during C drive resizing. This partition software can extend C drive system partition i.e. resize C drive even operating system is installed on this drive. If you need to extend C drive on Dell Server on Windows PC like Windows XP, Windows 7/8/Vista and Windows 2000, you can run IM-Magic Partition Resizer Free. It is free of charge and enables you to extend C drive effectively and safely. 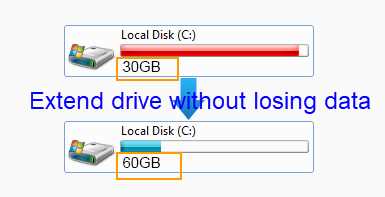 Have you ever encountered the similar problem that C drive is running out of disk space on RAID 5 in Dell Server? Are you wondering if you need to rebuild the RAID array in order to extend the RAID 5 C drive space? If there is free space on RAID 5, you can run IM-Magic Partition Resizer Server to shrink some unallocated space. And then, you can add the unallocated space to C drive by following the steps above. In this situation, you don’t need to rebuild RAID 5, and you will not lose any data on the RAID 5. If there is no free space on RAID 5, you will need to add new disk. Before adding new disk to RAID 5, you had better check if the RAID array can be compatible with the new added disk. The new added disk space will display as unallocated volume on RAID 5, so you can run IM-Magic Partition Resizer Server to add the unallocated volume to extend C drive. If C drive is non-system partition with NTFS file system, you can run Diskpart command to extend C drive in Dell Server. Diskpart command has the function of extending any non-system NTFS partition as long as there is unallocated space contiguous to the partition you want to extend. In addition, you can also extend C drive space in Disk Management. However, not all Windows OS allow you to extend C drive under Disk Management. Usually, Disk Management on Windows 8, Windows Server 2008 and Windows Server 2012 has the function of resizing disk partition. Whether you extend C drive by running Diskpart command or Disk Management, contiguous unallocated space is always needed on the same hard disk. If you want to extend FAT32 C drive which is non-system partition, you can backup data from C drive to an external hard disk and format C drive to NTFS file system. Then, you should move data stored on D drive (the drive behind C drive) to an external hard disk and delete the D drive in order to generate some unallocated space. Finally, you can run Diskpart command to extend C drive with the unallocated space. If you want to extend Dell Server C drive on RAID 5 without relying on any partition software, you can move all data stored on RAID 5 to another storage device and then format the disk and reinstall system to rebuild the RAID array. After rebuilding RAID 5 array, you can move the backup data back to the RAID 5.